SARVAM: An Experiment in Integral Community Building | Fourth Dimension Inc.
An integral approach to village development which includes the inner growth of people as well as the outer development of the community; with a people-centric inclusive and participatory process of growth; where development programmes and activities are identified, planned, organized and managed by the village community with SARVAM acting only as a catalyst of the development process. Background; the strategic vision; manaveli, a model hamlet: vision in action; village journal & TV; village coordinators & social workers; practices for inner growth. There are two factors, which make the Indian Village important for the future of India. First is that, the village in India, even now in our modern age, is a more representative unit of Indian civilization and culture than the urban towns and metros, which have become more or less westernized. However we need a more integral approach to Rural Development. The integral view looks at a community not merely as an economic and social unit but as a living human organism with a collective soul, mind and life. In this view the main emphasis is on inner growth of the community, which means mental, moral and spiritual development of the group, through education and yoga but without ignoring or neglecting the outer growth in the economic and social dimension. For, our approach cannot be integral if we ignore the development of the outer life. But the integral ideal is that outer growth has to be a spontaneous expression of the inner growth. Physical and economic development using available local materials and technology. Development of the family and community, particularly empowerment of women, skills enhancement and entrepreneurship. Psychological and cultural development through education and training. Spiritual development through the right understanding of religion, spirituality and Yoga, and their role in life. To ensure that all the required measures are carried out effectively, the people of the village are to be helped to understand the fundamental need for a change in attitude and consciousness. Thus the creation of dedicated village action groups is one of the first conditions for proper development in villages. This group will initiate and urge the people of the village to take up cultivation of lands in terms of improving the existing methods, tools and the general condition in the villages. In every village there is need to form a group of active people who will turn their attention to the development of every field of life, such as basic education for all, technical training for local works, organic farming, commerce, health, sanitation etc. SARVAM’s role will primarily be as a catalyst, support and coordinating group, motivating them to work for and take up the responsibilities for such change. The main activities of SARVAM revolve around the following areas of community development. The pre-school centre is functioning very well. The attendance of the children at the centre is very high. There is voluntary enthusiasm amongst the children to attend the centre. Hygiene and sanitation at the centre has greatly improved. The quality of the nutritious food supplied at the centre has become very good. Clothing was provided to the children. The mothers of the children are interacting with the centre in a very positive manner and are becoming better aware of the issues affecting the behavioral, health and educational aspects of their children. The mothers are also evincing interest in the proper functioning of the centre. The number of children attending the centre is 22, which is 95 percent of the total children in the age group 2 to 5 in the hamlet. The primary school is functioning effectively. Attendance in school is very good. There is a marked positive change in the students’ attitude, behaviour, friendliness, hygiene, enthusiasm and interest in sports and other activities. A set of school uniform, to supplement the one provided by the government, was supplied by Sarvam. Since many parents were unable to afford notebooks to their children, Sarvam provided them with the required notebooks. The social interaction between the children belonging to different caste and class groups is healthy. The parent-teacher association was activated resulting in increasing interest shown by parents in their child’s education. The village education committee is also functioning effectively. It took efforts to improve the school infrastructure and monitor the school’s functioning. The number of children attending the school is 50. 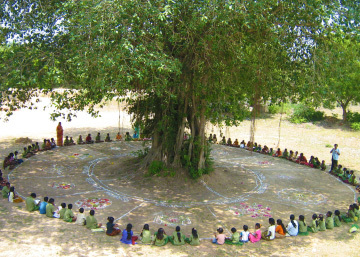 A new school building was constructed by the villagers, which was motivated by Sarvam. The total cost of the building was Rs.4,30,000, which was provided by the government. Sarvam provided Rs.75,000 to meet the shortfall for the purchase of building material. Sarvam’s sincerity in taking up this work motivated the villagers to personally supervise and monitor the quality of construction of the building. This building now enables the students to sit class-wise, whereas earlier all the students were bunched together in one room. A weekly informal children’s corner is conducted for children of all age groups. This provides an effective platform to teach good habits, attitudes and values to children in an informal way and also to kindle an interest for learning amongst children. This initiative received the appreciation of the villagers and the government education authorities. The number of children attending this centre is 54. Efforts to enroll dropout children in school were taken by giving them the necessary motivation and support. Three children have rejoined. Educational support in the form of loans to needy and deserving students was provided. This initiative prevented dropouts. Loans were also provided to girl children for the purchase of bicycles enabling them to travel to high school, which is 5 km away from the village. A new village community centre was constructed. The villagers themselves participated in the construction work. The centre is being managed by a village committee. It is being used for community gatherings, social events and family events. It has become the pride of the village. 58 households (90%) have been provided with individual toilets. Washing platforms in individual households were promoted. 35 households (60%) have been covered. These platforms divert wastewater to backyard kitchen gardens and prevent the harmful stagnation of water in cesspools on the streets. Individual household drinking water connections were provided to 23 households (40%) in the hamlet. A promotion campaign for the use of solar cookers, biogas units, solar lighting and CFL bulbs was conducted. Demonstration units were installed. The frequent power cuts were causing a lot of hardships to students and housewives. Portable solar lights were provided to the households at a cost of Rs.1,000 each, repayable in five equal monthly installments. This initiative was highly appreciated by the villagers. Under the housing programme, a total of 24 houses were constructed. The renovation of 18 houses was taken up and completed. Over 90% of the thatched roof structures were replaced with better roofing material. This has reversed the previous situation wherein a majority of the households used to be displaced during the rainy season when they had to take shelter in public places like temples, schools, etc. The improved condition of people’s habitation has brought about a profound change in them in the form of hope and aspiration for a better life. Their self-esteem and pride in ownership has been enhanced resulting in a visible trend towards a more conscious way of living. The government officials have appreciated this non-conventional approach towards beneficiary selection, funding, people’s contribution, and monitoring the quality of construction in their rural housing projects. The youth of the village actively participated in all community development programmes. The women of the village were actively encouraged to participate in meetings, which discuss all aspects of their lives and that of their community. They were encouraged to voice their opinion and offer suggestions. This exposure and experience has given the women the confidence and enthusiasm to participate in public issues and to express their opinion. Statutory women members in public bodies such as village panchayaths etc. are now exerting themselves and refusing to act as mere puppets in the hands of their husbands. Community gatherings were encouraged and promoted. Religious festivals, national and community events, sports and games events etc., were organized and celebrated by the women themselves with gaiety and fervour. The village temple renovation was undertaken by the women. The inauguration ceremony was also organized by them. Women started contributing money into a common pool for organizing and celebrating such events on an annual basis. These social interactions helped in breaking down long ingrained inhibitions arising out of illiteracy, gender, caste and class. The community revolving fund was very well utilized by the community. The fund was used to advance loans at a low rate of interest to people in dire need and distress. This enabled these people to get out of the clutches of the usurious moneylenders. The household backyard kitchen gardens initiated in the previous year started yielding fruits and vegetables. As a result the quality of nutrition improved in such households. A new all-weather road was laid in the village with the support of the panchayat. A conflict resolution initiative was undertaken by Sarvam to set an example for resolving conflicts in the community. A long pending stand off regarding the village temple renovation work was resolved with patient dialogue and understanding in which youth; women and village elders were brought together. The village community journal promoted by Sarvam, “Grama Pudiya Udayam”, is going strong. During the current year the circulation has touched 900. Out of this 600 are paid annual subscriptions. The journal has become a source of information and inspiration and a platform to voice public opinion and showcase talent. The community eagerly awaits the release of each issue, which by itself is a sign of its popularity. A programme for promoting a community television channel is being drawn up by Sarvam in collaboration with Sri S.R. Chari of Hans vision â€“ a renowned Chennai based media organization. Most of the equipment for this project has already been procured. Since the channel will be operated and managed by the village youth to the extent possible, training programmes for the village youth are being chalked out. This novel initiative hopes to enhance social cohesion and is expected to serve as an excellent medium for delivering development messages, not only within the Sarvam villages, but also in the surrounding villages through cable TV. They form the integrating link between the community and Sarvam. They are the channel through which devolution of the programme from Sarvam to the people is taking place. They are constantly updating their communication and documentation skills. They have gained a better understanding of the principles upon which Sarvam’s action is based. They have earned the respect and confidence of the community. To assist them in their work, a data collection format specially designed for Sarvam was prepared by Gandhigram Rural University; and a software system specially programmed for Sarvam’s use is being developed by Aravind Eye Care System. The data collection training for the village coordinators using the new format is in process. Living example of leaders and organisers who practice spirituality in their lives. Cultivating punctuality, harmony, order, beauty in habits, behaviour, action and organization of the outer life. Awakening the urge for progress and perfection in work and action. Importance of concentration on the work to be done. Need for truth in thought and speech and action. Learning through dialogue, discussion, questioning and action. Senthil, Chitra and Chiranjeevi are the leaders of the team which nurtures the rural development projects of Sri Aurobindo Society.